Goget AB (Sweden) is a leading producer of meeting room digital signage systems. 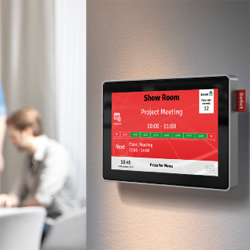 Our products can be used to quickly and effectively book meeting rooms via the email calendar or the convenient touch enabled displays outside each room. The Room Sync series is GoGets’s range of professional meeting room display systems. Manage room bookings via e.g. Outlook or the sleek touch-screens outside each meeting room, and present a wide range of customized information including availability, organizer, title and upcoming events.